It’s a significant time for the Runcorn Wetlands Dew St Bushcare Group with a changing of hands. Bruce Turner has been caring for this bushcare site, as bushcare leader, since 1997. After 20 years of wonderful habitat work, which has restored a wetland corridor in Runcorn to a healthy and productive environment, it’s time for Bruce to take a well-earned rest. B4C Catchment Manager Wayne Cameron says it has been a labour of love for Bruce who has been doing much of the work alone. “He faced many hurdles, including illegal dumping, deliberately lit fires and some vandalism,” Wayne said. 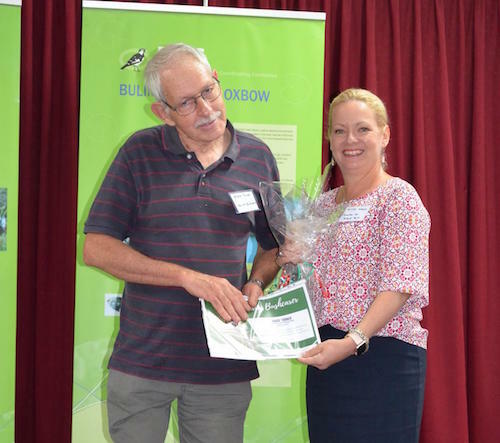 Bruce was awarded the Bulimba Creek Bushcarer Award at our end of 2017 celebration. “This is not an award for just 2017, it is a 20-year award for a most valuable person, whose work will be continued come hell or high water, fully supported by B4C and Council at Runcorn Wetlands,” Wayne said. He has also received a Lifetime Service Award from Brisbane City Council’s Habitat Brisbane program. It was presented to him at a handover event by BCC Habitat Brisbane Officer Anna Shera. During his time on the site, Bruce had been holding his working bees on the first Saturday of the month and says it’s been a challenge to get assistance. “Initially I did letter drops to procure volunteers to no avail,” Bruce said. 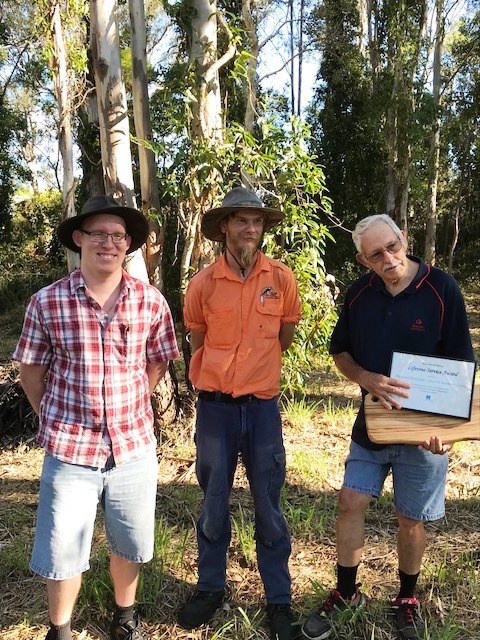 Mathew (Intrepid Landcare), Ben (bushcare group leader) & Bruce (previous bushcare group leader). He said obstacles included; the dumping of both green and other waste on the site regularly including white goods, fires destroying trees he has planted, weeds (including Glycene, Mile-a-Minute). But there have also been some wonderful achievements to be celebrated. “There are a number of indigenous species of this area I have planted which are seeding and seedlings are now growing strongly,” Bruce said. B4C is pleased to be welcoming another great bushcarer to drive the direction of this Habitat Brisbane site. Ben Bruynesteyn is a member of the B4C Landcare Services team. 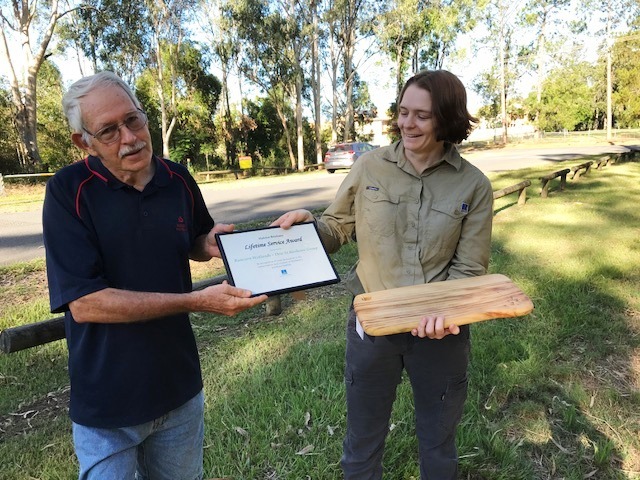 He will be taking the Runcorn bushcare group forward as bushcare leader on a voluntary basis. Runcorn Wetlands Dew St Bushcare site. Ben will also receive hands-on support from Brisbane Intrepid Landcare who will adopt the site as one of their projects. The site sits between several sporting fields, a school and an industrial area. It has the potential to provide good bird, butterfly and, possibly, fish habitat. It’s a minor waterway with wetland characteristics. 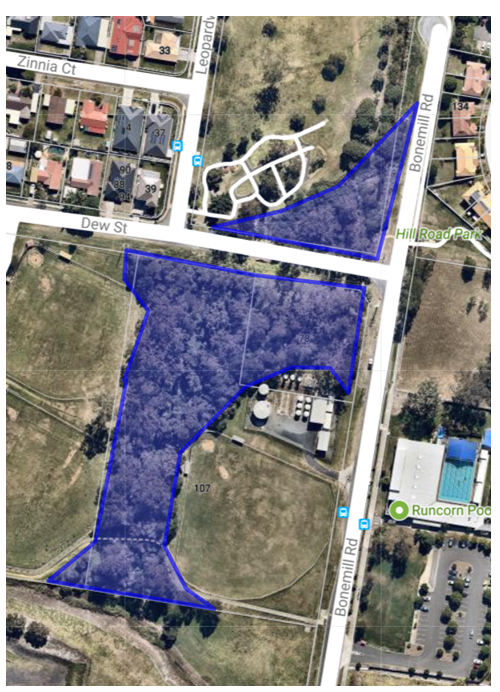 The site is part of a corridor network linking to the eastern leg of Bulimba Creek. For those wanting to assist Ben and the bushcare group as a volunteer (either regularly or occasionally), we love you to contact us.